Played for centuries in the ports of England , we've brought this game to the world for all to enjoy. The classic wood box and tiles give this game its old century charm. Roll the dice and lay down any combination of tiles to match your roll. Keep rolling until you can't match your roll on the remaining tiles. Low score wins; lay down all the tiles and you've â€œshut the boxâ€�. Easy to learn, this classic Bookshelf Game is fun for the whole family. 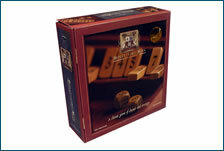 This wonderful old century style shut the box has brought many hours of fun to the house. It's a strategy game by way of rolling the dice and flipping down the appropriate tiles to satisfy the dice roll. Flip them all down and you have shut the box....but if you don't, your score can add up quickly. I even play by myself and see if I can beat my score from the time before. We had this one about 20 yrs ago and finally found it again. It is a simple yet fun game we now take on camping trips. It is good practice in math skills for kids and easy to learn. My niece and nephews love to play it on our campouts.I recommend for school age to adults.